We utilize standardized lesson plans, known as Gold Script, for each level, this lets the student progress based on their own ability, not a time frame. 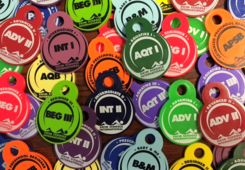 When each swimmer completes their swim level they receive an Advancement Medallion, a waterproof recognition tag, to show what levels they have completed. As they graduate from their level we will automatically start them on the next. YOU choose how far they go!